See how it works, now. We have begun our journey into creating personal spaces for learning, or rather, learning hubs. This entry was posted in Portfolio on 12 October 2009 by sguilana. I have been doing some research on how to explain the whole issue of portfolios to my highschool students and colleagues in Catalonia. 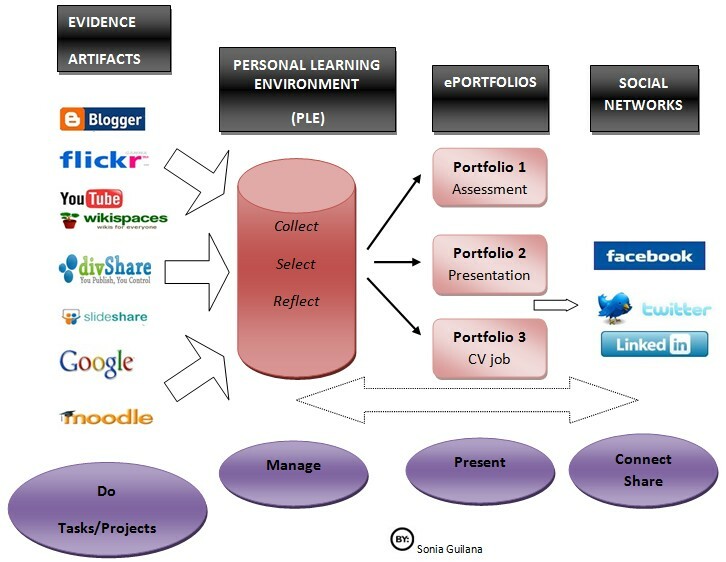 Here is a map for eportfolio making I have come up with. Based on David Delgado’s PLE and Derek Wenmoth via Helen Barrett’s blog. My goal is to highlight the steps of the process and I am not too sure about the first part yet… I might change it in the future. The first part, doing tasks/projects is the largest part of the student’s work, supported by different formats, text, audio, video, image and hyperlinked to collaborate connected in the making of activities in web 2.o support. The second step is how all these artefacts and evidences scattered in the web in an array of web 2.0 tools, Google tools, VLE like moodle and even paper-suported work have to be managed through organizing the collection, selecting the relevant artifacts for each portfolio with the corresponding reflections for critical analysis and personal development. The third step is the actual presentation of managed artifacts into a portfolio, according to the objective you are pursuing: Assessment of competences/subject/course/level accreditation…; Presentation of your digital self looking for potential users with common interests to learn/work with; Part of your CV to showcase the competences and achievements for future job recruitment. The fourth step is the connection of your portfolios to the existing networks, social (facebook), professional and social (twitter) or more job-oriented (linked-in) as means of presenting yourself . Social networks are however embedded in the environment our students live in and therefore they can interact in the whole process of eportfolio making. This entry was posted in Portfolio and tagged eportfolio roadmap on 24 July 2009 by sguilana. At the Language room, students choose from a range of activities what they want to work on, with whom and when. This possibility of choosing, even though from a closed set of activities, allows students to be more active, engaged and responsible for their own learning. It is a small step towards autonomy and student-centered learning. Yet some students are baffled by this freedom of choice, in particular the older ones at batxillerat, who have never been experienced this methodology before… Some say: “you are the teacher, tell us what is best for us.” They have always been told what to do and expected to carry it out… To put this belief of “teacher orders-students do”partly into question, is seen by some students, as a give-up on teachers’ duty. In reality, it is much more stressful for teachers, as it is an individual adaptation of sometimes up to 25-30 students, quiding, counseling, controlling everyone’s work and keep a checklist of the individual tasks. Adding to that, it is a bit more demanding on the students, as they have to think of the tasks available, select the material, write on their diary the tasks done with some evaluation etc. It is naturally far easier to sit back on a chair, wait for the teacher performance, passively listen or mechanically, take some automatic notes and switch off every now and then with a pretended look of interest… These same students often argue that they waste their time in this class, without having someone’s head over all the time.Given the choice, they prefer traditional teacher-fronted class tuition. However, most students thrive at the opportunity of freedom of choice. They browse through magazines and books till they find one they feel like diving into or choose from the range of grammatical exercises, films, songs, listening activities to do. The space learning design intends to foster choice by setting up different spaces for different activities. Students can work on their own or collaborate with others, which most do. Silence comes naturally, as attention is focused on different activities. Collaboration arises in a spontanous manner and students are willing to help each other, either with the content, the procedure or the technology involved. Special attention has been paid to light and colour that provides comfort and informality for a positive learning atmosphere. See for yourself and comment! This entry was posted in Portfolio on 29 April 2009 by sguilana. Do you want to talk in your blog? This entry was posted in Portfolio on 3 February 2009 by sguilana. Podcasting is one of the great resources to enhance our students’ oral compentence. 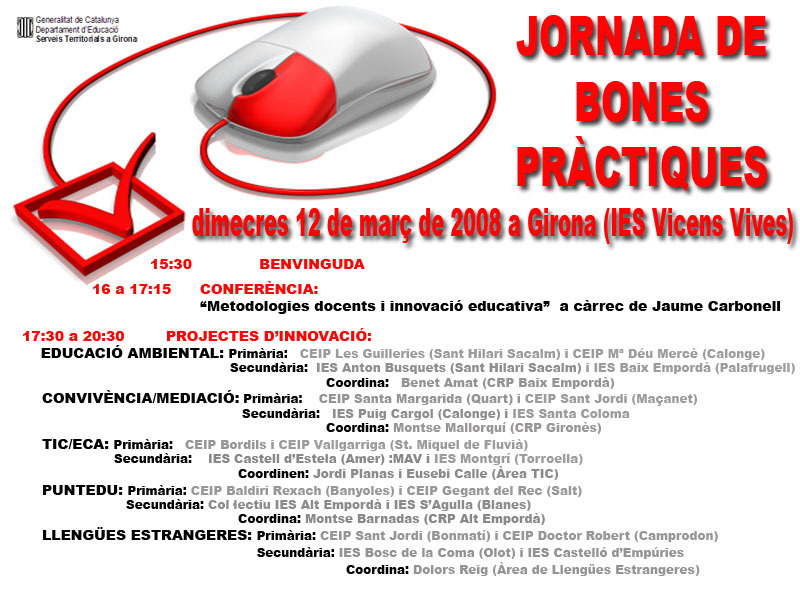 Here is my presentation at the Jornades de llengües estrangeres in Girona. Thanks for coming! This entry was posted in Portfolio, project, speaking on 26 November 2008 by sguilana. We look forward to sharing our experience with you and discuss on how to teach and learn English with digital natives in the XXIst century. Thanks for your interest! This entry was posted in Portfolio, speaking on 18 November 2008 by sguilana. This entry was posted in Portfolio on 16 November 2008 by sguilana. After 2 years working with eportfolios to learn English at Batxillerat, we are opening new lines of work. Our new project is the use of THE EUROPEAN LANGUAGE E-PORTFOLIO at 3 ESO and 4 ESO in September 2009 at IES Castelló d’Empúries. This project has been granted a llicència d’estudis from the Department for Education and I am currently working on the preparation of the materials for the implementation next year. The basic idea for me is to design a competence oriented syllabus based on a problem-based methodology (PBM) or question-based, as you wish, with web 2.0 tools . Now that we have an open framework such as the Competence Curriculum to work from, it seems to me that classrooms walls can break down for good and students start communicating with the real world. It is time for a shared construction of knowledge, team work and learning management in a truly student-centered fashion. Eportfolios are proving to be an open, flexible, personal tool to display, manage, analyze, guide and evaluate the learner’s performance. This entry was posted in Portfolio on 24 September 2008 by sguilana. This entry was posted in Portfolio on 12 March 2008 by sguilana. Within our project, native speakers from different English speaking countries are invited to give a talk to our students and so we have an opportunity to chat together and get to know another culture, another accent and some common interests and values as well. interesting, personalized and lively talk. This entry was posted in Portfolio on 26 February 2008 by sguilana. Mercè talks about her summer in Oxford. This entry was posted in speaking, video on 13 November 2007 by sguilana. Well, in 2nd batxillerat students have to learn some jokes in English and put at least one on their portfolios… Here we’ll have some and select the best for the final contest: the funniest joke in 2 bat! This entry was posted in speaking on 17 October 2007 by sguilana. Presentation of the academic year. Students working at the language room. This entry was posted in Portfolio on 17 October 2007 by sguilana. This entry was posted in Portfolio on 2 September 2007 by sguilana. This entry was posted in Uncategorized on 7 June 2007 by sguilana.